This is where you'll find all our long lost video clips that we've uploaded to YouTube at one time or another... including our little home-made music videos that not many people have seen and some extremely obscure student films from our pre-OOB days! Joe and Dan doing their favorite routine from the old TV Odd Couple sitcom. You can hear them laugh when Dan almost blows the whole skit - but Joe was able to get him back on track! Let it ride!! This song was originally intended for an animated film Donald was working on, which was never completed. He got just about as far as the pencil test before the project was shelved indefinitely. "I asked Dan if he can come up with a tune similar to the Beatles "Nowhere Man", which he did - and after hearing his demo for a while we both recorded this version in his room - which I believe may have been the very first time I went out to visit him when he lived in this old Bronx home. It's the house you see in his "Dead End Delivery" film." "This little home-made music video uses an even earlier film that Lloyd and I worked on, when little Jzero was featured as a Sesame Street Grover puppet. His ship was this big cardboard box that my parents refridgerator came in, painted white with wings attached - and I'm pretty sure that was Lloyd inside of it running down the street. I don't recall there being any holes in it so he could see where he was going. But that was Lloyd - always willing to risk life and limb for a film project." Always a big Laurel and Hardy fan, and an admirer of all Hal Roach's film works - this is perhaps Dan's best film. It features Dan and his friend Glenn, who was a real undiscovered natural when it came to pulling those "Little Rascals" type of facial expressions. Dan recalls, "This film was totally planned out by storyboard pics. It's my best film but was hell to make. For some reason if you go the Steven Spielberg way of shooting and planning every detail you'll come out with a beautifully shot and edited film like "Fish Funk" but you come out a nervous wreck because you constantly have to worry about detail and actors hitting their mark. I'm proud of the film and it's my best but I much prefer shooting in a wild spontaneous way like the "The 3 Kooges". It fits my mentality better and I'm more calm and relaxed because of my spontaneous nature. Just ask Donald and Joe when we create songs this way. It's much easier." Donald used to live just a few blocks away from College Point's MacNeil Park - which was just water's edge with a nice big field area to run around in - which is exactly what Dan, Joe, Lloyd and he did one blaring hot summer day while creating this little music video for "I Wonder". Lloyd pretty much stays behind the camera throughout, while Dan, Joe and Donald prance around and eventually get attacked by a marauding ventriloquist dummy. Donald recalls, "Most of the videos done back then were all accomplished by what's called "in-camera edits" - which basically means what you see is what we shot, in the order we shot it. We would usually shoot some alternate footage which would replace some of the original takes - but it was all very crude. As you can see by the multiple video glitches and picture drop outs - there was no such thing as camera stabilization in those days either! Somehow it just seems to add to the horror depicted in the video. The fainting and stumbling at the end of the video were all real. We weren't really acting - it was really hot that day." The song is another pure Dan gem - subject matter, unidentified flying objects, UFOs. "...Flying with metallic ships is all I see and all I do - I wonder, wonder, wonder very well..."
This song was a live jam between Dan, Donald and Lloyd, recorded in Donald's bedroom. You can hear Dan losing it, not to mention his timing - when Donald and Lloyd make him laugh towards the end of the song. The tune is sort of an improvised jazz-like take on a childhood song they'd sing, "Pray for the dead and the dead will pray for you - it's simply because they have nothing else to do." The video portion is taken from one of Donald and Joe's favorite horror flicks "Children Shouldn't Play With Dead Things" (the bald ghoul in the video would make them jump out of their skins!) a little bit of the infamous on-camera 1987 kiss-off of Pennsylvania politician gone bad, Budd Dwyer, and some dancing skeletons courtesy of Walt Disney. For some reason this clip gets the most hits out of all the OOB videos on YouTube. Probably due to ole' Budd. He's a regular internet draw. This odd little music video is the first time Dan and Donald decided to go out on their own and take a video camera along. The song is a rarity in that Dan usually doesn't dwell on such somber thoughts when writing his music, and he actually felt compelled later to do a totally revamped uptempo version of this song called "Time Mind." This version, however, is surrounded by much mystery. One belief at one time was that it was a song about the passing of Dan's family dog. Dan never did elaborate. For the video Donald began by filming Dan in MacNeil Park again, but then they jumped in the car and headed out towards the picturesque cemeteries of Middle Village, Queens. Donald recalls, "We just drove around it and Dan held the camera out of the window. The camera was one of those big bulky things that would attach separately to an even bigger, bulkier VHS recorder. It was amazing we could be mobile at all with that kind of set-up! It reminded me of how I used to see my Uncle Nolo record family movies - with this enormous get-up. The sleeping guy in the truck who looked like he was dead was just dumb luck! Little does he know he's been immortalized on tape." Another quick YouTube clip by Dan. He explained "Short comedy segment from an Out Of Bodies jam session back in the 1990's. Joe Vento & Mark Degross doing vocal sketch from Jerry Lewis & Dean Martin Chesterfields commercial back in the 1950's, Hilarious!!!" An early film project by Lloyd and Donald - A guy going for a stroll in the wilderness literally wakes the dead when he stumbles upon an unmarked grave. A fun, yet problem riddled attempt at making a primarily improvised horror film in Alley Pond Park, Queens. Donald played the poor, shell-shocked victim who stumbles upon (and is endlessly chased by) the living dead - played by Lloyd. Joe played the friendly camper who comes to Donald's assistance and tries to make him all comfortable - but ends up stealing the show in the second reel with one of the greatest spitting up of chocolate syrup scenes ever committed to film. Donald recalls, "Looking back at this film now I find it pretty amazing that we all got through it without serving jail time. I mean, we literally bury Lloyd in the park up to his neck - we light a roaring camp fire - that's got to be illegal! 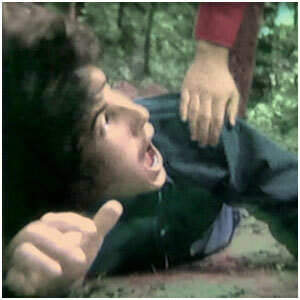 Then poor Lloyd almost gets stuck in the muddy bottom of the pond and it's a scene we barely use. We almost scared some old lady to death who was walking her dog - and Joe, after that blood scene with the chocolate syrup, those bees wouldn't leave him alone! Ah, those were fun times!"